After three days of exhibits, sessions and discussions, GEOINT 2015 is now behind us. Put on by the United States Geospatial Intelligence Foundation (USGIF), this was truly an event that highlighted all of the latest commercial geospatial capabilities available today and it clearly demonstrated how big data is now a major part of those offerings. Whether it’s building 3D models from satellite imagery and then analyzing it to provide line-of-sight maps, correlating location data with social media activity (Twitter, Instagram) to provide situational awareness, or using satellite video streams to provide traffic analytics, the power and utility of big data was made clear. Being able to merge streams of information, including satellite AIS data, to create geospatial intelligence is exactly what this symposium is about. We met with a broad range of solution providers who are specifically looking at maritime situational awareness information, such as satellite AIS and imagery data, to build out real-world solutions for government authorities and commercial organizations alike. In fact, it was the ability to dynamically display vessel tracking that caught the eyes of many conference attendees. Many weren’t aware of the value this data is able to provide for financial, safety and tracking applications. Being able to ensure Exclusive Economic Zone (EEZ) compliance, or to recognize potentially high-security-risk dark ships are critical requirements for both national security and economic well-being. 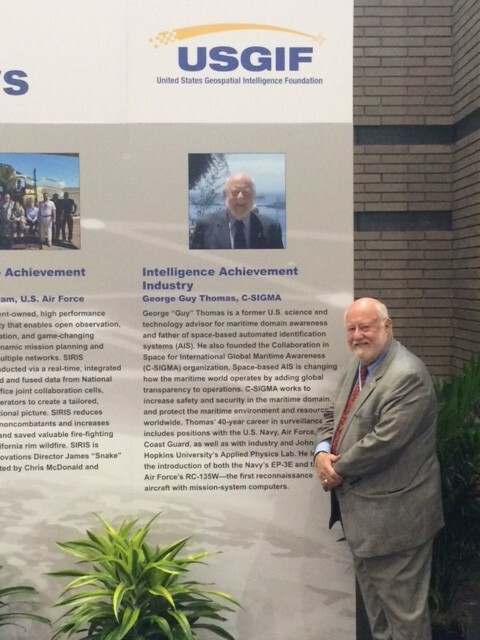 George “Guy” Thomas, the creator of space-based AIS, received an Industry Achievement Award from USGIF. But probably the biggest highlight of the symposium, at least in ORBCOMM’s eyes, was the official recognition that the USGIF gave to satellite AIS as an emerging and disruptive technology. Congratulations are in order to George “Guy” Thomas, the creator of space-based Automated Identification Systems for his industry achievement award. It was on October 4, 2001, less than a month after 9/11, that Guy picked up the phone and called ORBCOMM to gauge its interest in putting an AIS receiver payload on its Low Earth Orbit satellites. Guy was an employee of Johns Hopkins University Applied Physics Laboratory on assignment as liaison to the Naval War College. He was also deputy leader of the team tasked by President Bush, literally on 9/11, to identify U.S. vulnerabilities to terrorism in its maritime domain and to develop recommendations on how to abate/counter them. Guy received a brief on that date from the U.S. Coast Guard on AIS and immediately saw the utility of putting AIS receivers in space. From there, history was made as ORBCOMM was subsequently awarded the first government contract by the U.S. Coast Guard to build an AIS concept demonstration satellite. It was an honor having Guy join us in the booth this week and reminisce about the early days of satellite AIS, how far we’ve come along since then in commercializing satellite AIS service and the future of the technology as ORBCOMM gets ready to launch 11 more AIS receiver-equipped satellites later this year. See you next year at GEOINT 2016 in Orlando, Florida!